There are 2757 posts in this topic. You are on page 55 of 56. The soundtrack and callouts are fantastic! While trying to figure out what I did wrong on my NVRAM install, I fried SR13 on High Speed. I’m not even sure how it’s related to U25. I’ll save everyone the head scratching. 1J9 and 1J11 are keyed the same and on the same row. If you plug the solenoids into 1J9 you will toast SR13. Play testing the game now. Fingers crossed. Ouch! Hopefully it stopped at SR13. It appears that is the case. At least 10 games and the game is playing well and playing fast. At least 10 games and the game is playing well and playing fast. You should go and buy a lotto ticket! “Sign me up!”. I have just bought a Road Kings. Vengeance will be ours! I too just got a Road Kings and im having a blast playing it. Dont really understand the bad rap it gets, I think its just as fun as a lot of the other system 11s. I’m think of adding a headphone jack to each of my system 11 collection, anyone know where to start? You could try reaching out to Pinsider DUMBASS who lives here in Seattle. He has quite a collection and I believe most if not all of his machines are fitted with headphone jacks. Just picked up a High Speed and it boots right away into attract mode, but it won't start a game. 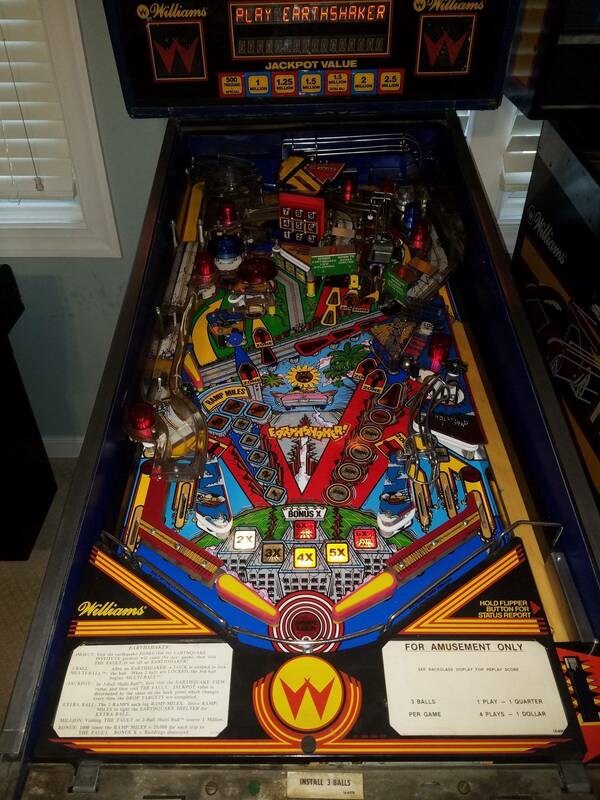 The outhole kicker sends the two balls to the right end of the ball trough when you hit the Start button, but solenoid #2 (ball kicker coil) does not kick a ball into the shooter lane and the game just sits in attract mode. I'm also not sure that one has anything to do with the other. I have voltage to the ball kicker coil, a good diode, tight wiring, it works in Test mode and grounding it's transistor, Q25, fires the coil. When both balls are to the right, next to the shooter lane, both switches show closed in the Switch Edges test. Any thoughts? Shouldn’t there be three balls in that game? As a dear friend of mine from West Virginia used to say, "Al, you are eat up with the dumbass". That did the trick, thanks rotordave! Now that I have gameplay, I've found that the left and right Hideout kickers and the left outhole kicker don't work. I can hear a click during Solenoid Test, but they don't fire. Heading down the homestretch here any more thoughts? If only all the fixes were that easy. Glad you're up and running. Good catch Dave! Sometimes it’s easy to overthink things. With your other issues, the click is probably just the A/B relay on the board moving over. 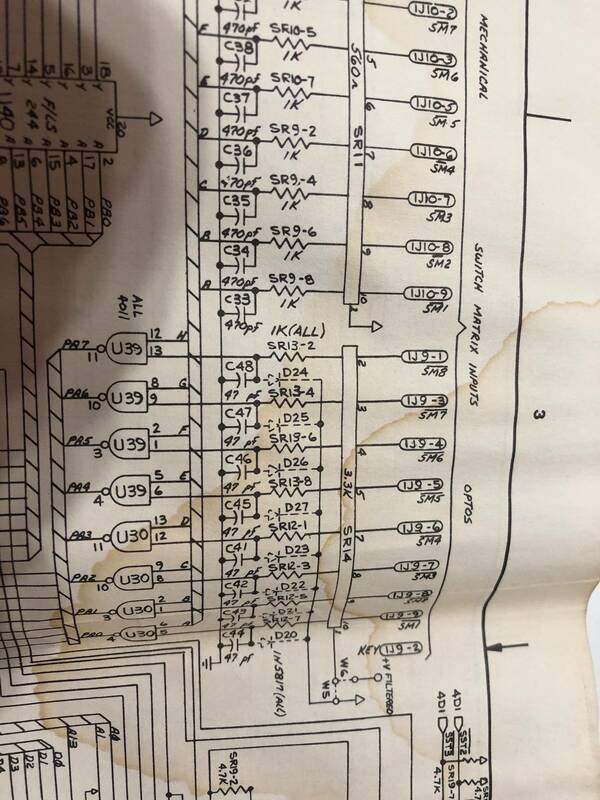 If all ok, get the manual and look at the solenoid chart ... check the wiring from each part of the chain. Could be as simple as one wire off somewhere up the line. Worse case you have some blown transistors. But always check the simple things first. There is a single fuse holder in the back box for those coils, should have a purple wire on it. Thanks guys. I checked all those, still no luck. 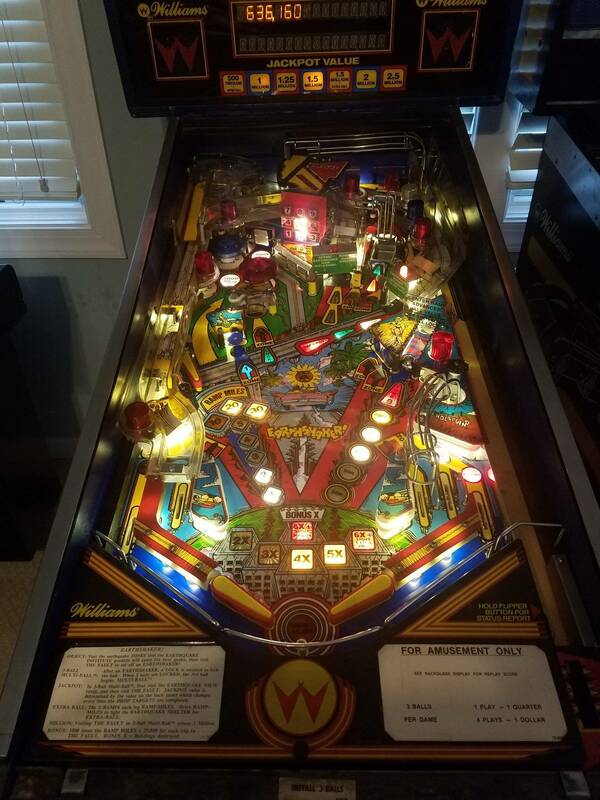 Pulled apart the under playfield connector and put it back together. That solved it. Must been a little corrosion in the joint. All three kickers work great now. One more issue. The two right red flashers don't work, but their transistor does not flash them when grounded. I'll check continuity between the MPU connector and the lamps and resistor board and if that doesn't do it, I'll test and change the transistor. I'll let you know how I made out. The 2 bulbs are wired in series, so if one bulb is burnt out neither will work. but their transistor does not flash them when grounded. So it's a play field issue, a broken dropping resistor, burnt bulb or a broken wire. Yep, that did the trick, one bulb was bad, even though it tested good at first with my DMM. The only thing I need now is one 7-digit alphanumeric display (C-10866), one does not work and has the "sparkles" in it that I understand makes it outgassed. If you have one of these for sale, please PM me. Boardset is a 10, works great, never any alkaline damage. No burnt connectors or header pins. Cabinet and head are beautiful, no fading. includes red rotating topper. Backglass is a 10, gorgeous. the upper left hand area are broken or chipped, as well as the bottom of the left sling plastic. 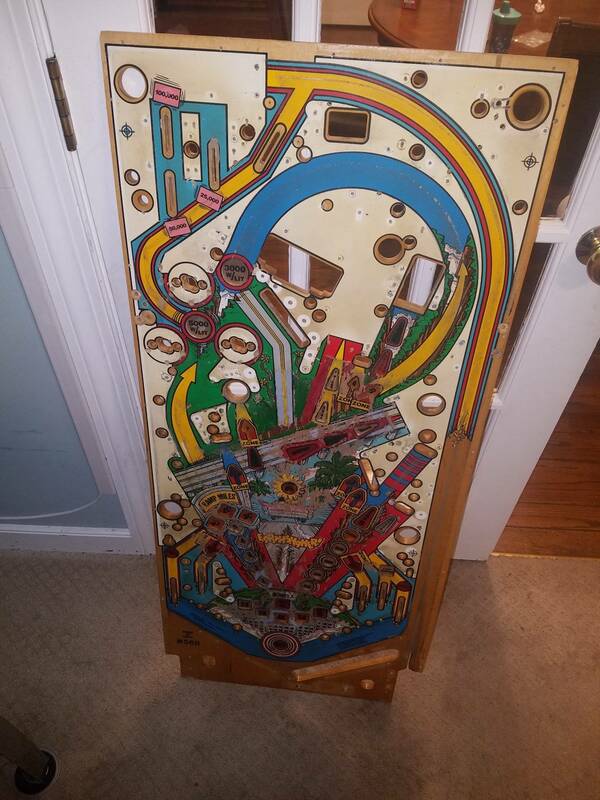 A new playfield would put this at or near collector quality. However, the machine plays 100%, now all switches, solenoids and lamps work. BAA has a graphics set for $49, and with a little touchup, this would be a great game. I will gladly entertain offers, and I will publish a Pinside ad, hopefully in a few days. Hey there System 11 family. 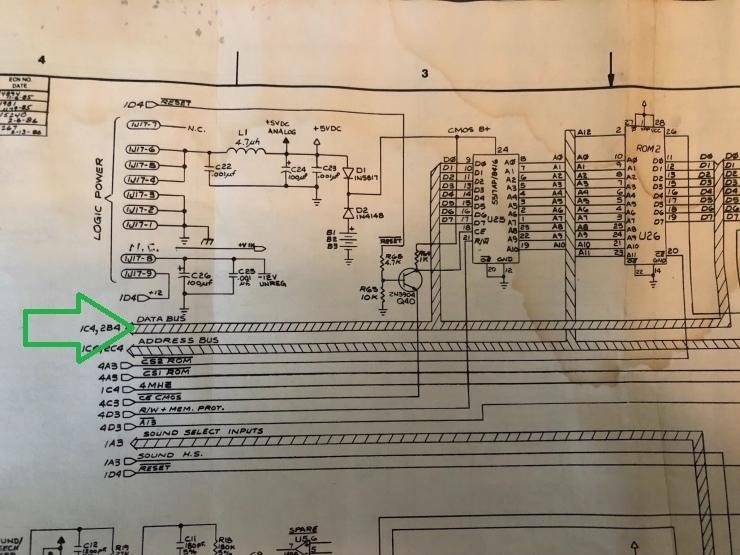 Where can I go to ask questions for System 6 issues? 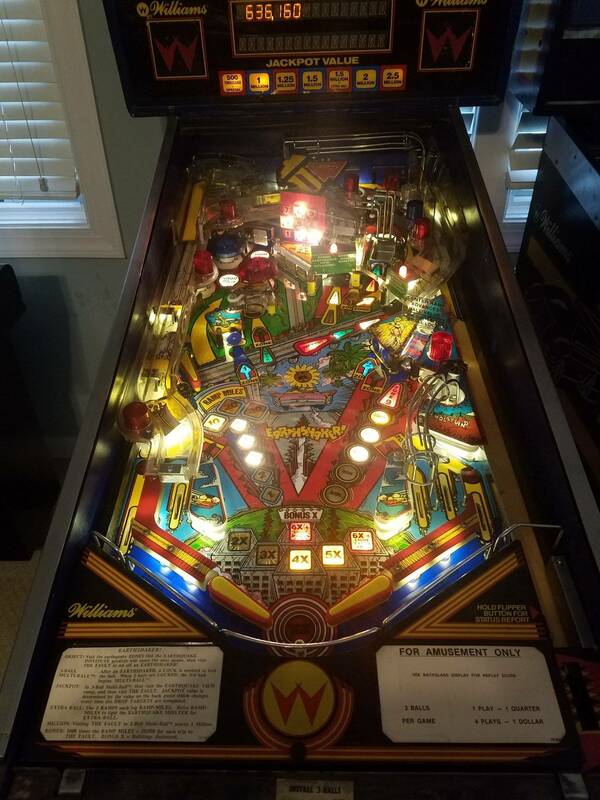 I have a Laser Ball that I just started working on (after rebuilding the bottom panel of the head) and am having some boot issues. I have read every post in this thread and feel that now I am qualified to join. I bought my Pin*Bot from a US Government surplus sale in 1995. It was working fine when I lent it to my brother for my nephew Matty who was 5 in 2005. Last year I was visiting and there were a number of boot errors and when I told my brother it needed to be fixed, he said he didn't have the time. With that, I took it back and have been refurbishing and bulletproofing for the last year or so. Fortunately at least he changed the batteries once a year so that was not an issue. It's now working perfectly and is a hit with Mimi (9) and Delia (14) our faux grandchildren. I am reading the boards and learning because when Miriam turns on the machine and hears "Pin•Bot Circuits Activated" it simply has to work! Thanks to you all for your support. Pinside rocks! Or should I say rolls? 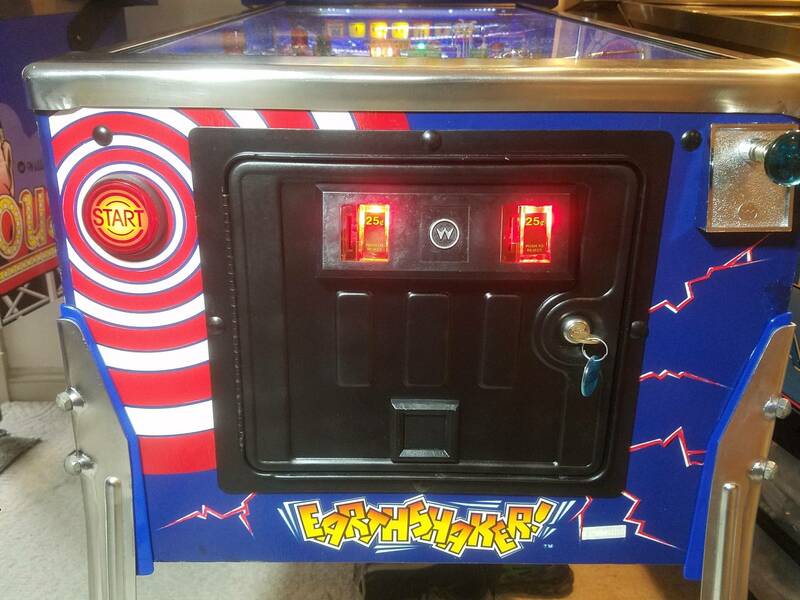 PS-And now that Pin•Bot is only in need of a few more upgrades, mods (today I think I will install the Special Solenoid Saver fuse board) and a good cleaning, I am thinking of going back down to Virginia to get the PacMan that they haven't really enjoyed for years! A couple of questions on this High Speed I have. Some of the graphics are worn off their inserts, how do I remove the rest of partially worn off graphics in order to install a new set? There a couple of broken standup target faces. Will any type of rivet gun work with the small rivet and new target face from PBR, for example? I’ve always just taped off around the insert and used really fine grit sandpaper. I have several screws missing in my #WW that hold the boards in the backbox. Can anyone tell me what size machine screws I will need to replace the missing ones? ok - I have a few questions that I'm hoping you guys can answer that are system 11 specific... I just picked up a Millionaire in need of some help. 1 - Has anyone ever had to remove paint from a cab that some idiot painted over? I'm 98% sure it's regular household latex, and I can see the original paint underneath. I've read about citrustrip, oven cleaner, etc - but wondered if anyone had done anything specific to sys 11 games. I can say that CitriStrip is awesome stuff... if you want *all* the paint gone It stripped the enamel from my HS spinners in < 60 minutes. Pretty sure it would be too aggressive for what you're after. Unfortunately, don't have any practical advice on what would work. Hopefully someone else chimes in. And give me your thoughts...thanks! I maybe should have posted in this thread first! 1. I seem to recall someone used just rubbing alcohol to remove latex paint from old EM machines. You may want to search around the forum some more in the restoration sections. 2. that is correct, the back box is tempered glass. It is thinner than the playfield glass. According to pinwiki, the back glass should be 27" x 19" x 1/8". 3. There is not much love for Millionaire out there, so a speaker panel may be hard to come by. I was able to use Purple Power to get some spray paint off my Comet. Wasn't a lot though. Looks much better when I was finished. Didn't seem to damage the original paint at all. I took out the non illuminated button and leaf switch and added this one to my Earthshaker. I didn’t have the tools to flush mount the smaller illuminated button so I chose to go with the larger Data East type. Rather simple to do and I think looks good. I wonder why there isn't love, especially now as system 11s are skyrocketing in price and desirability... I mean the theme is awful, but appropriate for the time. I haven't played it much as it was pretty dirty so I'm doing the tear down now, but it seems to have some neat shots, the wheel is cool, the skillshot is inventive, it has a third flipper for side shots, etc etc. I know the speaker panel is a long shot, but anyone have (or have the ability) to scan their side art? I tried rubbing alcohol and magic eraser and what's underneath is in pretty sad shape. I'm going to match the inside dark blue and paint the cab at least to the correct blue, maybe get someone to print a decal if possible. Ok... I have another Millionaire related question... Anyone know where to source a 7-digit glass from that doesn't cost a 1/10th of the whole machine? Player 3 is out, so that's numeric only... I see Pinball Life only carries alpha numeric 7 digit glasses. PBR has them, but they are nearly $80 and have the bubble on the back... Marco shows them out of stock and replaced by LED... 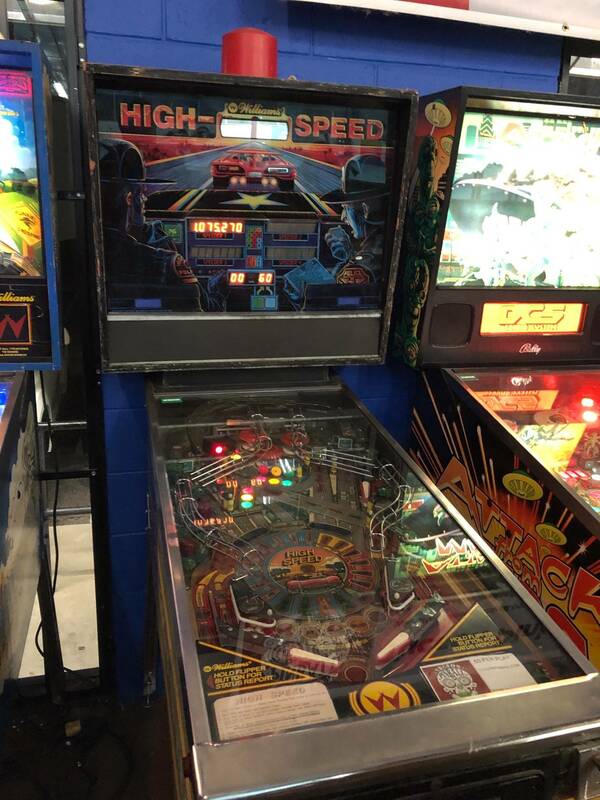 I'm not feeling an $80 solution let alone the $279.99 pinscore replacement for a cheap game. Anyone have a suggestion? 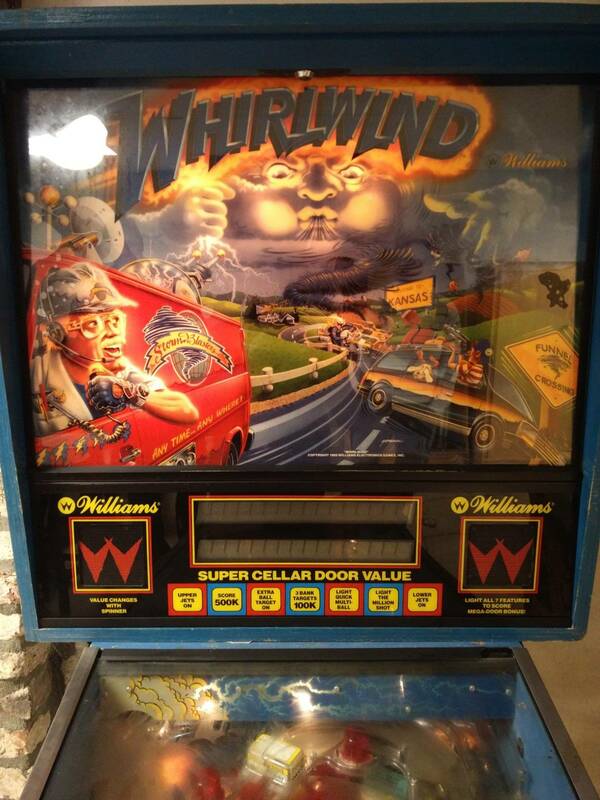 The Whirlwind I bought has a lot of (wet?) spots on the translite: mostly on the left side where the person/van is, and on the right above the funnel crossing sign. Added a photo but it's hard to see. Can I just seperate the translite from the glass and clean them both? Yes. But be very careful with the translite. It’s kind of like a photograph and will scratch super easy. I Am sure someone will chime in with the proper method as there are many more experienced people on here than I.
I learned the hard way when cleaning a translight with a rag and windex. All the printing started to come off. Of course I think all of the damage was already done when someone threw a beer onto it previously and the beer got in between the glass and translight. Check out the old one. I think someone used a rock instead of a pinball. 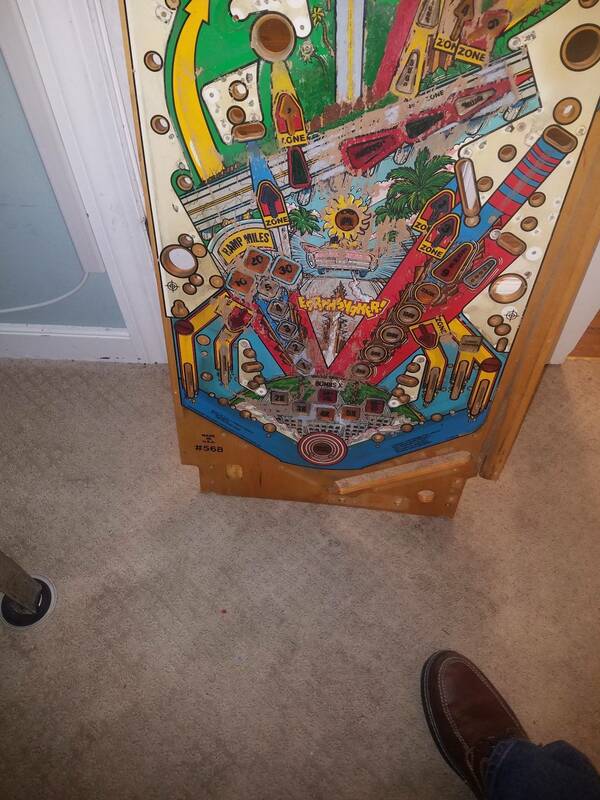 someone used a rock instead of a pinball. It's not multi ball, it's multi pebbles. Quoted from Alan_L:Now that I have gameplay, I've found that the left and right Hideout kickers and the left outhole kicker don't work. I can hear a click during Solenoid Test, but they don't fire. Heading down the homestretch here any more thoughts? Found the real culprit: The Flipper Power Supply Board also powers the Hideout kickers and the left outlane kickback. When they all quit again, I took a closer look at this FPSB and found that the bottom connector actually wobbled up and down and had the worst case of cold solder joints I've ever seen. I removed the old solder, reflowed the header and it works great. Motto: Always check for cold solder joints. Cures a lot of problems, easy to diagnose, quick to fix, cheap to fix. Well this is new. Game will freeze after a game ends. Power cycle fixes it, but not ideal for location. Any ideas? Anyone know where to get the little black plastic that goes around the displays? 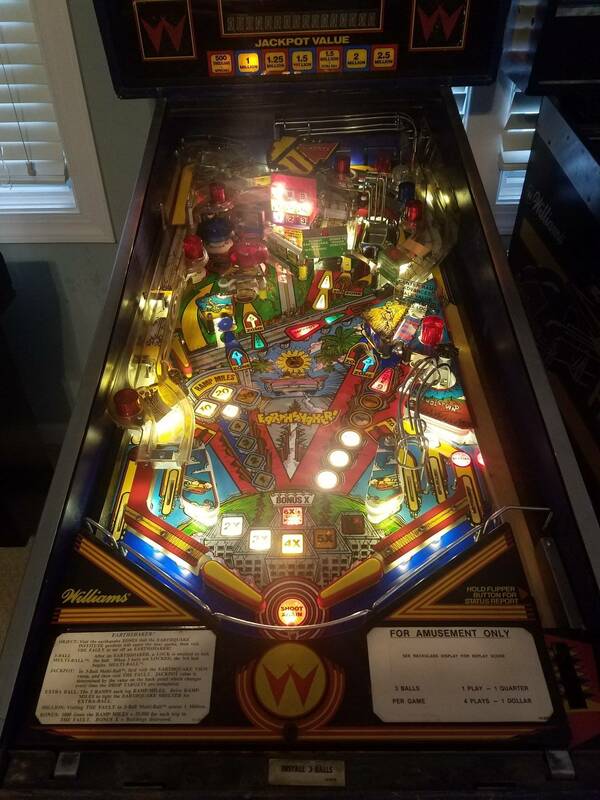 Thanks to JMount - I successfully transplanted an old Pinbot display onto my Millionaire board - but the black light lock around it did not survive being pulled from the old one.